Alsace is home to the best Gewürztraminers on the planet and Rieslings that are among the finest anywhere. The region also excels with a unique style of Pinot Gris that is quite unlike any other, with rich, opulent, mostly dry wines that feature strong aromas of tropical fruits, honey and mushrooms. All three varieties also produce what are some of the world's most profound late-harvest sweet wines. As if that weren’t enough, this beautiful, welcoming growing region also offers crystalline Sylvaners, aromatic Muscat wines, spicy Auxerrois and a host of ever-improving sparkling Crémants and Pinot Noirs. Moreover, Alsace’s wines have no peers when it comes to compatibility with a range of ethnic cuisines. These are wines that match well with the likes of Thai, Chinese, Vietnamese, Korean and other Asian creations the way that Chardonnays and Sauvignon Blancs only wish they did. Unfortunately, a look at sales of Alsace wines in the U.S. shows that not everybody shares my enthusiasm for these magnificent wines. Interestingly, this is not the case in other countries, such as Italy, where the popularity of Alsace’s best bottlings remains high, if not quite at the level of Champagne or Burgundy. Wine lovers have come to appreciate the rich textures and very pure aromas and flavors offered by Alsace’s top efforts, but until recently the region’s wines were handicapped by rather generous levels of residual sugar in even purportedly dry wines, which could make purchasing them tricky for consumers. Happily, Alsace wines are now drier and fresher than they were just a decade ago. Moreover, most estates have taken to using a 1 to 5 sweetness scale on their back labels (where 1 represents driest and 5 sweetest); although not all producers are enthusiastic about this novel idea, this system is very consumer-friendly. Another very positive recent decision by the ODG de l’AVA (Organization de Défense et de Gestion de l’Association des Viticulteurs d’Alsace) has been to officially authorize the use of the word “sec” (dry) on back labels when the wine is truly dry. By European Union rules, this means less than 5 grams per liter of residual sugar or up to 9 grams per liter of r.s. provided that the wine has at least 7 g/l of total acidity, which is a level high enough to effectively make the wine taste dry. This decision, to be implemented as of 2016, will effectively eliminate from the shelves all those Alsace wines that have previously been sold as dry even though they might carry as much as 20 grams of residual sugar. Clearly, consumers interested in the category of Alsace wine will benefit from knowing a little bit about the house styles of at least the major producers. For example, estates such as Trimbach, Hugel and Léon Beyer have always produced resolutely dry wines throughout their range. Or, you can rely on a trusted wine merchant, or, better yet, use this article and my recent report on Alsace’s 2013s to find wines that are likely to make you happy. Alsace’s high-quality viticulture and its outstanding wines have been documented for nearly a millennium. Wines from outstanding grand crus such as the Rangen and Sporen have been described and sought after since at least the 12th century. Clearly, among the region’s many strengths is its wealth of distinctive grape varieties and superior terroirs. All of Alsace’s white wines share a certain opulence and richness of flavor, at times with relatively high alcohol levels, but they also offer a wide range of aroma and flavor profiles. Unlike wines from the rest of France, with just a few exceptions Alsace’s bottles are labeled with the name of the variety. Clearly, it’s Alsace’s great Riesling and Gewürztraminer wines (both dry and sweet) that stake its claim to white wine immortality. The region’s Rieslings might not blessed with the almost magical floral daintiness of the best examples from the Mosel (or their low alcohol levels) but they offer greater power and texture, along with wonderful perfume, excellent delineation, convincing minerality and serious ageworthiness. Even better, dry Alsace Rieslings rarely come across as angular or bitter, unlike many of their Old World and New World counterparts. Likewise, Gewürztraminer is rarely bitter, because an element of sweetness is routinely used to buffer the inherent amertume of the terpenes and other aromatic molecules that give Gewürztraminer wines their highly aromatic quality. With this variety, it’s important to avoid high yields, otherwise the wines tend to become too obvious and almost vulgar in their showiness. 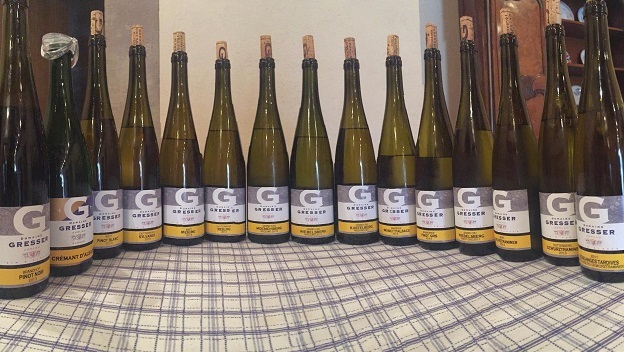 In Alsace, colder calcaire (limestone-rich) and clay soils of younger geological origin are ideally suited to the variety as they allow for potentially better acid retention in the wines, which is critical as Gewürztraminer is a low-acid variety. Alsace’s Gewürztraminers age much better than one might expect (I still own many 15-to-20+-year-old bottles that are beautifully vibrant and fresh): a combination of factors, including high alcohol and strong polyphenol structure, help to make up for the variety’s low acidity and ensure graceful evolution in bottle. Don’t make the mistake of writing off Pinot Gris (exactly the same variety as Italy’s Pinot Grigio): the best examples from Alsace are some of the world’s greatest white wines, comparable to white Burgundies in their mouthcoating texture, depth and complexity. Unfortunately, though, too many Alsace Pinot Gris wines are downright bland, owing to very young vines, excessive yields or overripe grapes. High yields are anathema to Pinot Gris, as they are to Italy’s Pinot Grigio wines as well, because the variety can become dilute, even neutral, very quickly. Therefore, it’s hardly surprising that some producers are tempted to overripen their Pinot Gris grapes or leave a little residual sugar in an effort to make up for a lack of complexity and texture. 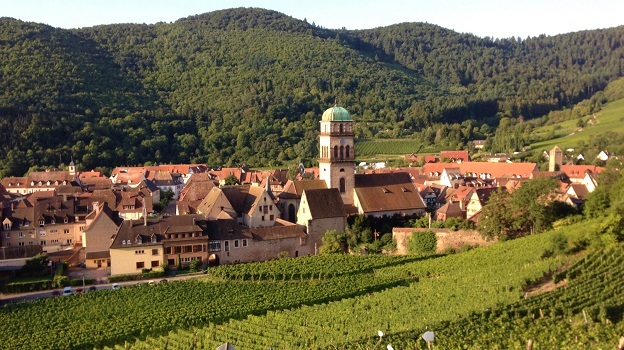 Although great Alsace Pinot Gris wines are never short on opulence, they should not be frankly sweet or overly alcoholic, and striking that perfect, if elusive, balance is what separates Alsace’s better estates from the average ones. Attentive Vinous readers know that I champion little-known grape varieties every chance I get, especially when those cultivars have merits that for reasons usually linked to fashion or wine snobbery go unrecognized or have been forgotten. For example, Sylvaner is one of the world’s most misunderstood grapes and currently very unfashionable, even if there are some encouraging signs that Alsace’s producers are starting to devote more attention to it. This is a real shame, as old-vine Sylvaners are some of the most thrilling and least expensive white wines you’ll drink anywhere; I urge you to hunt down Alsace’s best examples whenever you get the chance. Sylvaner can give totally dry, perfumed wines that are reminiscent of Rieslings but with more of a minty, herbal aspect. A minority of estates prefer to harvest their Sylvaner grapes late and make amazingly opulent, delicately sweet wines that express rich aromas and flavors of apple compote, quince jam, honey and chamomile. The Zotzenberg, Kirchberg and Zinnkoepflé grand crus have been historically associated with great Sylvaner wines. Unfortunately, Sylvaner, like Pinot Blanc, was not initially recognized by Alsace’s legislators as a “noble” variety, and thus wines made from this variety were not allowed to show the grand cru’s name on the label (Alsace’s wine law, since amended, stated that only Gewürztraminer, Pinot Gris, Riesling and Muscat could be used to make grand cru wines). Not unexpectedly, producers ripped out the less-favored varieties, replanting with Riesling, Pinot Gris and Gewürztraminer everywhere they could, as being able to write “grand cru” on the label ensured higher prices for their wines. Of course, nobody stopped to think that these “noble” varieties might be planted even in unsuitable sites, and thus “grand cru” on an Alsace label is not necessarily a guarantee of quality. Another factor contributing to Sylvaner’s demise was that it is not one of the varieties designated for use in Crémant, Alsace’s increasingly popular sparkling wine. Clearly, all of these obstacles have meant that even when decent Sylvaner is grown, it sells for low prices, and thus there is little economic incentive to grow it. Clearly, when Sylvaner vines are overcropped, the wines turn out vegetal, instead of being delicately aromatic, with fresh citrus fruit and floral notes. The fact that Sylvaner yields discreet wines in the first place makes matters worse, as these bottles often fail to capture the attention of inexperienced wine writers at tastings. And yet, in Alsace most Sylvaner vines are very old, so the best wines can be remarkably complex and deep. Look for bottles from such producers as Agathe Bursin, Barmès-Buecher, Burn, Dirler-Cadé, Kuentz-Bas, Léon Beyer, Albert Seltz, Seppi Landmann and Domaine Weinbach; Josmeyer and Ostertag mainly use a red-berried variant of Sylvaner that gives a very different wine. Muscat is very important in Alsace (it’s a local staple with oysters), but two main varieties are actually grown: Muscat à Petits Grains, also known as Muscat d’Alsace (a white-berried grape of which there also exists a red mutation, much more common in Alsace than people think), and Muscat Ottonel, the latter a very early-ripening grape that tends to lose its acidity quickly. However, as it ripens easily and produces intensely floral wines even at copious crop levels, Muscat Ottonel has become the favorite in Alsace, especially as the Muscat d’Alsace doesn’t always reach full ripeness here. So producers generally blend the two together: wines labeled “Muscat” are blends dominated by Muscat Ottonel, usually by an 80 to 20 margin. This is not a bad idea, as the two complement each other nicely, the Ottonel delivering perfume, the d’Alsace body and structure. Famous grand crus for Alsace Muscat wines are the Goldert, Spiegel and Kirchberg du Barr, where the presence of calcaire makes for more refined, delicate wines. Dirler-Cadé, Muré, Schoffitt and Zind-Humbrecht make outstanding Muscats. Pinot Blanc is especially important in the production of Crémant, and it is undeniable that Alsace has made great strides in the past decade to improve this sparkling wine’s overall quality. However, Pinot Blanc made as a still wine has had a long and distinguished history in the region. The variety is prone to producing high yields, and in fact little is gained by keeping its production very low: the vines fight this intervention by bloating their berries, and very neutral juice is frequently the result. A well-made Pinot Blanc, on the other hand, exudes refined aromas and flavors of white stone fruits, flowers and beeswax. But don’t forget that in Alsace, mono-variety Pinot Blanc wines are rare. Most are blended with Auxerrois, a variety that adds spice and texture. Often referred to as Pinot Auxerrois, this variety is actually not a member of the Pinot family. The Sonnenglanz grand cru has always been one of the best sites for high-quality Alsace Pinot Blanc. But, as with Sylvaner, Pinot Blanc has never been included in the list of Alsace’s noble grapes and the inability of producers to use grand cru names on their labels was a virtual kiss of death for this variety. Consequently, most of the great old Pinot Blanc vines of the Sonnenglanz were pulled up, only to be replanted in recent, more enlightened times. Jean-Baptiste Adam, Josmeyer and Marc Kreydenweiss all make Pinot Blanc that’s worth a hunt. Last but not least, Alsace is becoming a growing source of very good Pinot Noir wines, owing to a number of factors. The region enjoys a warm, long growing season, and better clones and massale selections, in conjunction with ideally suited rootstocks, are producing better raw material than ever before. Modern vinification techniques aimed at extracting not just color but also fleshy fruit and nobler tannins have helped make Pinot Noir a real Alsace success story. While Pinots from Burgundy and Oregon need not quiver in their bottles, no other Alsace category has improved more in the last 15 years. Readers should note that these wines still mostly fly under the radar of collectors, but the best of them are roughly equivalent in quality to good village wines from Burgundy and cost a fraction of the price. Muré, Albert Mann, Deiss and Hugel are among the best names to seek out. 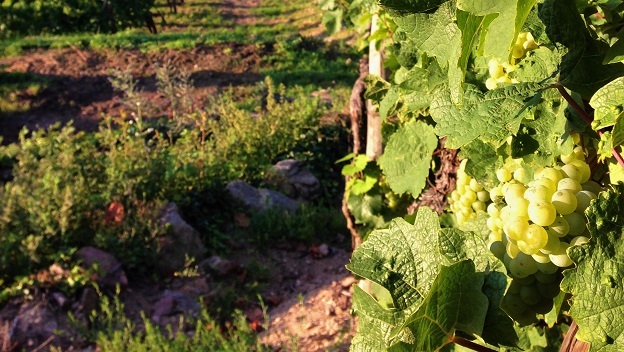 The 2014 vintage is not going to be remembered in Alsace as particularly memorable. Some producers, such as Albert Seltz in Mittelbergheim, declassified all their cru wines, while others, such as Bott-Geyl and Ostertag, declassified only their Gewürztraminers. But many decent, easy-drinking dry wines were made, and some are outstanding. For the most part, the wines are fairly classic in style, displaying high acidity but also lower-than-usual alcohol levels. Sweet wine production was minimal in 2014. An exceptionally mild winter, with practically no frost, was followed by uneven spring weather, leading to a drawn-out flowering. Clearly, some varieties fared much better in 2014 than others. The vintage is best for Riesling, Pinot Blanc and Sylvaner, while Gewürztraminer had a very difficult time, as it was just too cold for the variety to ripen properly (coulure was another problem for Gewürztraminer). August was plagued by record rainfall—nearly six inches—making it even tougher for thin-skinned varieties such as Gewürztraminer. In my experience, most 2014 Gewürztraminers are quite austere and some show downright strange olfactory profiles. In fact, all red-tinged or red-berried varieties had a miserable time in 2014, as infestation by Drosophila suzukii reached nightmare proportions. This vinegar fly has become a major pest in Europe and Asia; unlike other flies, the Drosophila suzukii attacks fruit early in the ripening cycle rather than targeting rotting fruit. The fly deposits its eggs just under the grapeskin, the larvae hatch and the grapes are spoiled. An overabundance of available fruit contributed to the problem in 2014: everywhere I went during my winery visits that summer I saw trees bursting with mirabelles, cherries and plums, and so the vinegar flies had a huge reservoir of food. Happily, Drosophila suzukii was not much of a problem in 2015. Alsace’s more serious 2013 wines, most of which are bottled and released later, have turned out nicely. While some of the region’s entry-level 2013 Rieslings were tart and thin, with little in the way of structure, the more important sites delivered better-balanced wines with high-acid personalities like those of 2010 and 2008. If it hadn’t been for the rainstorm of October 5, the 2013 vintage might have turned out to be another memorable year like 2010. Without doubt, it was the Pinot varieties, including Pinot Noir, that were the winners in 2013. Note: Alsace still expresses total acidity in terms of sulfuric acidity, so I have converted these figures to tartaric acidity, as the latter measurement is more commonly used elsewhere in the world.